Through everyday practices like avoiding the use of disposable products and sorting garbage for recycling, communities in the Argentine interior are joining forces to implement more effective environmental policies. BUENOS AIRES, Oct 30 2012 (IPS) - Over 30 small and medium-sized municipalities in Argentina are jointly developing policies for climate change adaptation and mitigation. The idea is to raise awareness and work together to help these communities cope with a global problem, say the promoters of the initiative. “Big municipalities have technical teams. The problem is in the districts with 10,000 to 50,000 inhabitants, which are also isolated,” Ricardo Bertolino, coordinator of the Argentine Network of Municipalities to Confront Climate Change, told Tierramérica. “Without peers to discuss these issues with, other priorities always seem to take precedence,” added Bertolino, who is also the deputy secretary of the environment in Rosario, in the eastern province of Santa Fe, although this city, one of the largest in Argentina, does not form part of the network. Through the network, representatives of smaller municipalities are able to receive training and exchange experiences in areas like renewable energies, waste management and sustainable tourism, while making a commitment to address the issues that affect their communities. “Being part of the initiative and participating in the monthly meetings keeps them involved. They leave with new ideas for sustainable small-scale projects, which they can implement in their own communities,” said Bertolino. Launched in 2010 in the town of Monte Caseros, in the northeastern province of Corrientes, the Argentine Network of Municipalities to Confront Climate Change was created in response to recommendations from international organisations that address climate change for reducing the emissions that cause global warming and mitigating the impact of this phenomenon. Up until now, 34 small and medium-sized municipalities have joined the network, although the majority of them are from Santa Fe, Corrientes and the eastern province of Buenos Aires, the country’s most populous. Each pays a monthly membership fee of 100 pesos (21 dollars). “Nobody is paid a salary and we have no financing. The fees go towards maintaining the website. It’s a small initiative with the goal of putting the issue of climate change on the agendas of small municipalities,” Bertolino said. At the meetings with municipal representatives, “we don’t give lectures,” he commented. Instead, successful experiences from different municipalities are presented as a means of sharing knowledge and promoting the engagement of the largest possible number of government officials, private companies and civil society. “We need the different sectors to work in coordination, and for someone from these sectors with the power to make decisions to participate,” he added. Among the most active members of the network are Colonia Emilia, a district with a population of 1,000 in eastern Santa Fe, and nearby Llambi Campbell, with a population of 3,000. Both are surrounded by cattle ranches and above all by plantations of soybeans, which is currently Argentina’s leading export commodity. 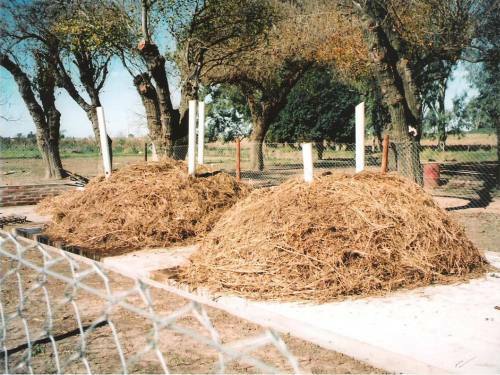 The representative of Colonia Emilia, agronomist Eduardo Paviotti, told Tierramérica that the town is working on the sorting of waste at the source, in order to feed the biodigester at Monseñor Vicente Zazpe College of Agricultural Technology, where he himself works as an instructor. In Llambi Campbell, also represented by Paviotti, organic wastes are used to produce compost, which is then distributed among local residents. In addition, plastic, glass and paper and cardboard waste is separated for recycling, while used batteries are disposed of in plastic drums sealed with cement. This community places special emphasis on saving electricity and reducing contaminating emissions. “Since cars are used a lot here, we launched a project to encourage children to ride their bicycles to school,” said Paviotti. Tierramérica asked Paviotti if he did not think that the efforts of the municipality amount to a mere drop of freshwater in the ocean, since the two municipalities are tiny islands within vast fields covered with genetically modified soybeans. In addition to the threat it poses to biodiversity, this transgenic soy is resistant to spraying with glyphosate, a chemical herbicide which, depending on how it is handled, can contaminate the soil, air and water. “We, as technicians, believe that soy can be grown without causing contamination, and that the companies that use agrochemicals should adopt less toxic production practices,” he responded. “The problem is that the economic power of these companies is too great to have an influence on them,” he added. In any event, Paviotti said that he works with rural producers to improve the cleaning of the glyphosate containers that contaminate the urban area. The containers are reused in the region even to transport water, despite the toxicity of their original contents. “We recommend triple washing, which consists of filling the container with clean water three times, shaking it, and pouring the contents into the sprayer, so that the remains of the product end up on the fields and not in the town,” he explained. The expert and activist said that the local residents generally cooperate willingly with the sorting of garbage and the safe disposal of batteries. However, it has been more difficult to persuade farmers to commit to the safer management of glyphosate. “Consciousness raising is difficult. For example, with regard to the containers, the farmers are always in a hurry, and the economic cost of the time spent using the machines for cleaning them takes precedence over the environmental cost,” he lamented. Nevertheless, despite the challenges, the idea of the network has sparked the interest of other municipalities in Latin America, who have begun to request assistance in order to replicate the experience. Bertolino has already provided training in Ecuador and has now been invited to do the same in Brazil and Venezuela.